Format: Online access from a secure folder. 1200 hypertext pages (= 4000 A4 pages). 6000 illustrations. 100's of worked examples. 1000's of notes & refs, + R-code. How to get R (it is free). Availability: How to get access. Description: This is a practical, up-to-date, interactive biostatistics course and reference work for undergraduate or postgraduate biologists. 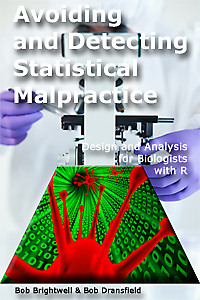 - It shows how readily malpractice can be identified in statistical analyses, and critically evaluates a huge variety of medical, veterinary, and ecological examples. - It evaluates the reasons for statistical malpractice, from ignorance to mistakes to fraud. - It clarifies the conflicting terminology, explains the statistical controversies, and reviews common errors in design, analysis and interpretation. - It describes the popular study designs, plus many advanced ones - and examines their reasoning, strengths and weaknesses. - It explores the reasoning behind statistical analyses (including worked examples) and explains how they are affected by their assumptions, study design, and data. - It uses simulation models to explore the logic and assumptions that underlie the standard formulae, and exposes their behaviour when those assumptions hold - or when they fail. If you want to publish worthwhile results, or defend your conclusions, or critically evaluate others' work, this is invaluable. £ 25* *Single user, open ended, 100% online, multi-machine access. Pay via PayPal, safely and reliably. All orders are completed by hand, usually within 24 hrs. Will it display ? Our hypertext pages can be displayed by most devices, provided they have a reasonably up-to-date browser. Must I have R ? R is not essential for reading this book, only for doing the excercises (they include an intro for those new to R). R requires Windows, Mac, or Linux. Get R (it is free)→ Base-R for Windows and base-R for MAC include a graphical user interface.